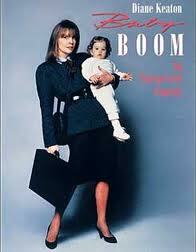 on cable the other day, i watched a chick flick from the 80’s called “baby boom”, starring diane keaton (i like her a lot because of her style with intelligence, understated confidence and timeless elegance). the film is about this ambitious & successful career woman working in a large corporation in the food industry, but her life changes completely after she “inherits” a sweet baby girl from her estranged cousin who had passed away from some deadly accident. despite her initial challenges trying to work it out between her job and the baby, she eventually leaves her job, moves to the countryside and starts her own business with gourmet baby food (and the story continues). in the course of the film, it shows how difficult it is for women to be successful in work and in her personal life especially when it involves children. this theme is nothing new nowadays, but i was surprised to realize that the film, questioning the norm of the working environment at the time, had been made over 20 years before. an amazing thing is that we are still facing similar problems at this very moment in 2010, in japan, where a number of women are struggling to get a reasonable, if not good, work/life balance. i’ve seen many of my very talented girlfriends leave or change their responsible jobs to less challenging ones, because it is just impossible to survive in this society if you don’t sacrifice one way or the other. well girls…. should be ambitious, right?